Port districts don’t typically have budgets with a lot of wiggle room, let alone significant marketing funds. And, as stewards of public assets, efficient use of funds is critical. So, while the contracting of a commercial realtor is helpful when a port chooses to sell property, paying the 5 percent – or more – realtor commission fee on a high-price tag land transaction causes a bit of a “gulp” at many a port commission meeting. Additionally, busy commercial realtors are not always able to keep up with the nuances of properties and the assets – existing or emerging – of the communities in which these properties are located. Port representatives, therefore, often find themselves in the selling seat. Port of Ridgefield CEO Brent Grening has frequently lamented about this conundrum. “I’m concerned about the cost of using their services in a public sector environment,” he says. About 18 months ago, Grening’s concern fell upon the ears of some local entrepreneurs well-positioned to affect a change. Vancouver-based businessmen Keith Stauffer, John Laine and Jim West have stepped in to provide a private-sector business solution to Grening’s and other port representative’s woes. Their company, PortEngine.Net, provides ports with the means to market and transact property at a greatly-reduced cost. 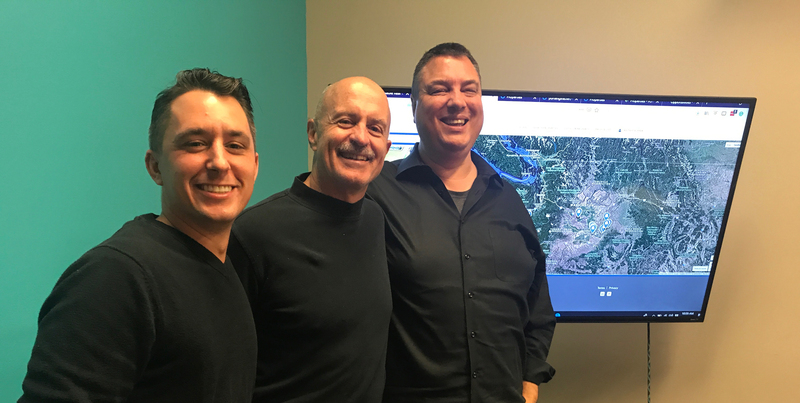 PortEngine launched from downtown Ridgefield and now operating from co-working space in Vancouver, is an online marketing platform for ports; they pay only a 1 percent fee when a successful property transaction or lease occurs. This savings leaves more money in a port’s pocket…and ostensibly lowers the purchase price for the buyer. “A low fee and no out-of-pocket expense at the outset – port commissioners like that,” says co-founder Stauffer, who holds the position of CEO and head of operations at PortEngine. He brings a track record of entrepreneurial success – including in the software analytics arena – to the PortEngine team. Stauffer explains that PortEngine is a way to bring buyers and sellers together without third-party involvement. The firm’s software provides a state-wide property inventory that includes all the participating ports. Through PortEngine, ports act as their agent and do their own negotiating and can upload to the site all documents pertinent to a potential developer or investor. “Most developers have tools and resources to know whether they can do the deal,” says Laine, a Port Engine co-founder and its chief strategist. He’s also the founder and CEO of local angel investment company Local.Fund, bringing vision and financial capital knowledge to the PortEngine table. Jim West is a longtime commercial realtor in the area, and is currently with Zenith Properties NW, LLC in Vancouver. He’s also one of the largest investors in PortEngine. When West first heard about the idea he wasn’t convinced. Later West met with Grening, Laine and Ridgefield resident Charles Swatzell, CEO of Vancouver software development firm Formos. West believes there will always be buyers with little experience who need help from a commercial realtor, but in the longer term, plenty of developers will want to be signed on to PortEngine. PortEngine incorporated in the fall of 2017. Since that time Stauffer, Laine and West have logged around 8,500 road miles, thus far visiting 35 of the state’s 75 port districts to introduce them to the company and the concept. Currently PortEngine has six port partners on board, and is working actively with 15 more. Port of Ridgefield and the ports of Camas-Washougal and Chehalis are contracted and have full-blown integration on their websites. “Our goal is to have all of Washington’s ports on our network, but we understand the larger ports will likely to be slower to come along,” says Stauffer. Smaller ports stand to gain more immediate benefit from the collaborative nature of PortEngine, as it allows them to market to a broader audience and extends their reach to prospective buyers. As of press time, PortEngine had raised $215,000, some of which came from LocalFund. The company is seeking additional investors to fund new features such as the ability to showcase community capital projects completed or proposed so a developer or investor sees the full potential of a site. Stauffer believes the future of real estate and technology is merging. As for the Port of Ridgefield’s Grening, he’s appreciative that his issue has been solved in what has become a business opportunity for some enterprising and talented locals. Adding emphasis to the local aspect of PortEngine is its work with Washington State University-Vancouver, to give students jobs and work experience. To make it possible, PortEngine donated funds to WSU’s foundation, which helps the university pay student wages for the program. Work experience with PortEngine includes software development, marketing and social media through the university’s Creative Media & Digital Culture fellowship. For more information, and to view videos detailing how PortEngine works, visit PortEngine.Net. To ask questions about investing contact Keith Stauffer by calling 206.931.5124 or email Keith@PortEngine.net.